The RAM Variable Speed Mixer is perfectly suited for mixing slurries and liquids with a wide range of viscosities. Ideal in the ceramic pressing industry for mixing plaster and resins for die and mold making, or even for glazes. This mixer features a 3 horsepower motor with AC inverter control. Torque and speed are fully adjustable with a maximum output of 875 RPM. This mixer secures to your wall and will accommodate containers as large as a 55 gallon drum. The standard model includes 7"Ø stainless steel prop type mixing blade and measures 9' tall, 18" wide, and 24" deep. Design can be adapted to fit your particular situation. These sturdy mixing buckets are crafted from stainless steel and are available in four standard models. They are ideal for use with the RAM variable speed mixer. The smaller models are well suited for single die batches or smaller multiple die batches. They feature a pouring spout for precision pouring with less mess and two lifting lugs for use with a crane. They are available in 8 and 14 gallon capacities. The larger models are available in 30 gallon (shown) and 55 gallon capacities. 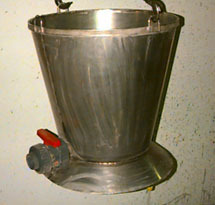 They feature either a side discharge spout (shown, standard) or a bottom discharge spout. These models also feature 4 lifting lugs for sure handling.